Deadbolts are great for added security and lots of people are even a little more comfortable about double cylinder deadbolts. The reason is because unlike a single cylinder deadbolts, a double cylinder is keyed on both sides of the door (where as a single cylinder is keyed only on the outside with a manual thumbturn on the inside). Generally double cylinder are used on partial glass doors to keep intruders from being able to break the glass and simply unlock the deadbolt from the inside – they will need a key to unlock the deadbolt. Double cylinder deadbolts can be a safety hazard in case of emergency, as it requires a key to unlock from the inside. Most cases a single cylinder does a great job keeping intruders out, but there are some cases where a single or double cylinder deadbolt just isn’t enough to feel secure and safe. There is a new extra strong deadbolt out there now called the Ultimate Lock. Click here to watch a video demonstration of the Ultimate lock vs. a standard deadbolt. You can see in the video how it can withstand anyone trying to kick or ram the door! It can withstand up to 4000 pounds! When the lock is engaged you wont have to worry about it being bumped or picked. The Ultimate lock is provided with longer screws than your standard deadbolt and absorbs the impact. In other words, it ‘marries’ the door jamb and door frame together and becomes a solid brick wall. And if the intruder really wants in he would have to knock down the whole wall in order for that door to be kicked in. Another cool feature the Ultimate lock provides is that it has a patented lockout feature, which means with a simple push of a button the lock renders any key useless, even if an intruder has your actual house key! To check out more features click here. The Ultimate Lock comes in satin nickel, polished brass, and antique brass finishes. Brass Accents isn’t just kickplates and house numbers, it’s much more than that! Yes, Brass Accents kickplates are probably the most popular item, but they do have door hardware, house numbers, push and pull plates, and floor registers to offer too! Getting into a little more detail, their door hardware is super high class and quality, you won’t find hardware much like it. And when looking for door hardware, (door knobs, lever handle sets, entry sets and deadbolts) you may find there are hardly any option for a backset size that measures under 2 3/8″. I mean, there are some doors out there that have 2″ backset sizes, and it can be real tough to find something close to that. Real brief, what is a backset? A backset is the measurement from the edge of the door to the center of the bore hole (the large hole where the door knob is installed). Standard size backset measurements are 2 3/8″ – 2 3/4″. Brass Accents has made the search a little easier on you! They have 2 deadbolts that are available with the 2″ backset size. This single cylinder deadbolt (means that it has a keyed cylinder on the exterior and a thumb turn, like the one shown above, on the interior) comes with everything you see here, the 2″ backset deadbolt latch, mounting hardware, and keys. It’s available in 13 different finishes! Such as polished brass like shown, weathered black, oil rubbed bronze, pewter, satin nickel and lots more! This double cylinder deadbolt (meaning it has a keyed cylinder on the exterior, as well as on the interior) also comes with all the mounting hardware, 2″ backset, and keys. Choose from all 13 finishes! Hopefully these 2 deadbolts with 2″ backsets help ease your stress a little! Please give us a call if you need help ordering. The B250 latch is kind of like an entrance lever or door knob latch, where you can close the door (or gate) behind you and there is no need to turn a knob for it to latch. Compare it to a regular deadbolt latch, where you have to manually turn the inside thumb turn or outside key to bolt the door shut. Don’t try and shut the door when that deadbolt latch is engaged, or you might end up with a dent in your door jam. The main purpose of the B250 deadbolt is to use it on a gate (hence the name gatelatch) for condos or apartment buildings where it is necessary to keep the door locked after exiting. Maybe for like a pool or maybe a utility room. This way there is no need to require occupants to have a key to exit, there is a turn piece from the inside that you simply turn to exit, and the outside keyed cylinder always stays locked behind them after they exit. And this is also a great idea for emergency reasons, because you don’t want someone to have to try and find a key to exit in case of emergency like a fire for example. 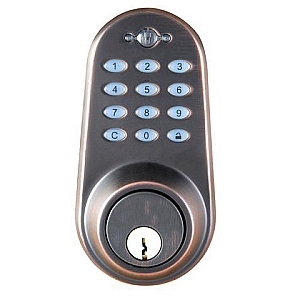 The B250 gatelatch is available as a single cylinder deadbolt, which means it has a keyed cylinder only on the outside. And this deadbolt is also reversible, which means you don’t have to worry about handing when ordering. That makes ordering a lot easier. The gatelatch is also available in Satin Chrome, Oil Rubbed Bronze, or Bright Brass. The Schlage Commercial Restroom Indicator Deadbolt. We have been selling these like crazy lately. Easy to install and it will work great in an office or business. When unoccupied it shows a green “VACANT” sign, and when the door has been locked from the inside it shows a red “IN USE” sign. The deadbolt also includes an emergency key. Who Says Your Deadbolt Can’t Have Style? Most people don’t think that a deadbolt can even be stylish. It is usually looked upon as a piece of hardware that is just stuck in the door and can’t be played around with. Emtek has an arts and crafts single cylinder deadbolt that gives you just a taste of what you can do with the deadbolt in your house. Keep in mind that this is for only one side of the door. You will have to buy the rest of the locking mechanism separately. The arts and crafts deadbolt has a design that isn’t seen often. A raised design around the edge gives you true pop on the door. The corner accent pieces make everything come together. The arts and crafts deadbolt is a sampling of all the deadbolt options out there. Be sure to look at the rest of the deadbolts we have to offer. Emtek is always leading the industry in door knob design. They are constantly coming up with new ideas that push the style and reliability of door knobs as we know them. They released the Art Nouveau line that boasts features that have rarely been seen before. The line’s single cylinder deadbolt is cast in bronze with a traditional European styling. Its unique swirled design adds class to the door that is hard to find any where else. Keyless locks with remote key fobs are a popular type of keyless lock because they give you the option of using your key fob, key or key code on the keypad. Much like your car key fob you use to unlock your doors the Lockstate keyless deadbolt uses a similar key fob, except that your horn won’t honk and lights on your house won’t flash when it’s locked or unlocked. This keyless deadbolt comes in a variety of finishes and you can even order multiple key fobs if you want. Sorry, you still have to remember not to let your key fob go through the washing machine.